This post is a travelguide about the best things to to do in Tiraspol and why you should travel to Transnistria. I decided to travel to Transnistria during independence day in September and had a great experience. Let me explain why you should travel to Transnistria too before I delve into the best things to do in Tiraspol, its quirky capital. I don’t blame you if you never heard of Tiraspol or Transnistria before. The tiny piece of land between Moldova and Ukraine is one of those forgotten conflicts in Eastern Europe. A country that does not exist and is sometimes called the North Korea of Europe. A nostalgic place that still embraces its Soviet past, but with an uncertain future. With my love for obscure places I was of course keen to travel to Transnistria and learn more about some of Europe’s least known independence struggles. Transnistria declared itself independent from Moldova in 1992 after the collapse of the Soviet Union. However, nobody recognized the break away republic and officially it is still part of Moldova. In practice though, it is a seperate state with its own government, currency and army. Most countries in the region quickly moved away from communism, but Transnistria was reluctant to let go of the Soviet ideals. While Moldova is keen to join the European Union, Transnistria has no desire to do so and remains in favour of the East. In fact, they would love to become part of Russia again. But with politics in between, Putin prefers a more covert support in the form of a Russian peacekeeping mission that is maintaining the current status quo. Transnistria’s independence comes along with the country being shunned by the rest of the world. And despite a longing to return to communism, the current reality is one of wild west capitalism with democracy being of secondary importance. Transnistria celebrates their independence day every year on the second of September. Only two days after Moldova’s Limba Noastra. The national day when Moldavian, rather than Russian, became the state language in the then Moldovan Soviet Union republic. I decided that this was the best time to travel to Transnistria. What about visiting a cognac factory or the largest sturgeon facility producing excellent caviar. These are just some of the things to do in Tiraspol. Independence day is probably the best day to travel to Transnistria. We arrived in Tiraspol the day before, when preparations were already in full swing. In the evening families strolled through the park near the river where there was an exhibition of tanks on display. Obviously Transnistria is proud of its army and independence day is partly about showing off its military strength. The next morning started straight away with a military parade. There were a lot of important officials around, but the people of Tiraspol couldn’t be too bothered. There were few visitors, most of them tourists, and it was actually a rather dull affair with various sections of the army marching and chanting. It was only after the military parade that more people showed up for the fair with local food and traditional dance performances. Most popular of all were the stalls selling shaslyck. Even though it was only 10 in the morning, beer and vodka were already consumed in large quantities. The fair lasted throughout the day and at night there was a big concert with fireworks. Unlike the military parade, it seemed that now everyone in Tiraspol had come to party the night away. For those that have an interest in the Soviet Union there are plenty of things to do in Tiraspol. Tiraspol is a time capsule and at times it feels like an open air museum of Soviet times. Along the main boulevard you find the House of the Soviets and the presidential palace. Both are still guarded by a stern looking Lenin. It is definetly worth it to stay the night and take the time to simply wander around. Some urban exploring away from the main street brings you eerily quiet neighbourhoods with Soviet flats and abandoned factories where you are likely to be the only tourist around. No Soviet city is complete without a war memorial and a visit is among the top things to do in Tiraspol. The memorial of Glory at Suvorov square remembers those who died in the Great Patriotic War (WW2), the Soviet-Afghan war and the Transnistria war. The Transnistria war in 1992 was short, but lives were lost on both sides. It resulted in the current set-up in which Russian peacekeepers support its independence that is not recognized by any country. Like the war memorial, every Soviet city has a park of victory. Strolling around in the evening together with families and young couples is one of the fun things to do in Tiraspol. In 1947 the park was made on the outskirts of the city for recreation. Since then Tiraspol has extended its borders. Nowadays the park is more in the centre of the city and remains popular. At last every Soviet city has a market. The one in Tiraspol looks like a modern affair with its green building, but inside is a traditional farmers bazaar with fresh fruits and vegetables. This is the best place in Tiraspol to buy and try some delicious honey or homemade cottage cheese. Next to the green market is the rather new christmas cathedral. It was completed in 1999 to become the largest and most important Russian orthodox church in Transnistria. In september it was still very warm in Tiraspol and nothing looked more inviting than joining the families swimming in the Dniestr river. A closer look revealed that the water isn’t all that clean. If you are brave enough you can swim in the Dniestr, but one of the things to do in Tiraspol is a boat trip on the river. They leave near the Aist hotel. One of the things to do in Tiraspol is a visit to the Kvint liquor factory. The factory won more than 100 medals for its brandies at international competitions. A visit allows you to taste and buy the locally famous cognac. Kvas is a drink made from fermented rye bread. It is honestly not my favourite, but it seems I am the exception. The stalls on the street selling kvas from yellow jerrycans are very popular among the locals. Tiraspol has the second largest sturgeon breeding facility in the world. Tours must be arranged beforehand at hotel Rossiya. Even if you can not visit the Aquatir facility, caviar is sold in Tiraspol’s shops at affordable prices. The town of Bendery is only 18 kilometers from Tiraspol and it is easy to visit. The main atraction is the 16th century Ottoman fortress that saw intense fights between the Turks and the Russians before it became part of Russia in the 19th century. The fortress is well preserved and used to be a Russian army base. The fortress is now open to the public and has a small museum and wonderful views on the river. The army base is still there and you can see some interesting mural paintings on the walls if you leave the fortress from the south gate. How to get there: trolley bus number 19 travels frequently between Tiraspol and Bender (20 minutes). You can get out at the first stop after the bridge over the river and walk to the fortress. Keep in mind that you now have to enter through the north gate. This is quite a walk and you might consider taking a taxi. You can exit again through the south gate and catch the 19 trolley bus back to Tiraspol. Next to the fortress is the Alexander Nevski church dedicated to the last Russian tsar and his family. The paintings inside the church show several pictures of the Romanovs including an image of the moment the Bolsheviks killed the family. I am not sure when this church was built, but it looked pretty new to me. I had no time to visit the Noul Neamt monastery, but it is easy to visit from Tiraspol. Most churches in Tiraspol are new, but this all male monastery is from 1861 and is one of the most important religious sites in Transnistria. During Soviet times the monastery was used as a tuberculosis hospital, but in 1989 it was beautifully restored and opened its door again for believers. How to get there: The monastery lies in Kitskany village 7 kilometer south of Tiraspol. Take the car ferry over the Dniestr river at the Aist hotel and then take the bus to Kitskany (15 minutes). My main reason to visit Tiraspol was its odd status in Europe as a country that doesn’t exist. I had zero expectations about things to do in Tiraspol for food lovers. Little did I know that there is great food on offer and that there are plenty of places where you can splurge on the mix of Moldovan, Russian and Ukrainian cuisine. Kumanek is without doubt the best restaurant in Transnistria and is aming the top things to do in Tiraspol. It serves some of the best borsht, vareniki and other traditional ukrainian dishes with a transnistrian twist. La placinte has several branches in Tiraspol and has an extensive menu with Moldavian and Ukrainian food. The food is ok, but nothing compared to Kumanek. Travel back in time at this local cafe where Lenin and Stalin watch you eat. This is probably the cheapest and quirkiest place to eat in Tiraspol. The homemade soups and meat dishes aren’t too bad either. We stayed in the Lenin Street hostel. A great hostel in a Soviet flat in the centre of Tiraspol. The owner does not live there so you need to agree a time of arrival with him. He is friendly and very punctual. The same owner runs the Red Star hostel and camping at the outskirts of Tiraspol near the river. The best way to visit Tiraspol is from either Chisinau in Moldavia or Odessa in Ukraine. From both cities there are frequent minivans to Tiraspol. In Chisinau they leave from the main bus station. There is a fixed location with minivans to Tiraspol and the journey takes 2 hours. Just ask people at the bus station where it is and ignore private taxi driver suggesting there are no vans. They leave when full and you can expect a van to leave every 30 minutes or so. There is also a train leaving Chisinau around 07:00, stopping in Tiraspol around 09:30 and then moving onwards to Odessa where it will arrive at 12:30. In the summer it is daily, but in the winter it only leaves on fridays, saturdays and sundays. Read more about Chisinau on my post about the best things to do in Chisinau: Soviet Europe. 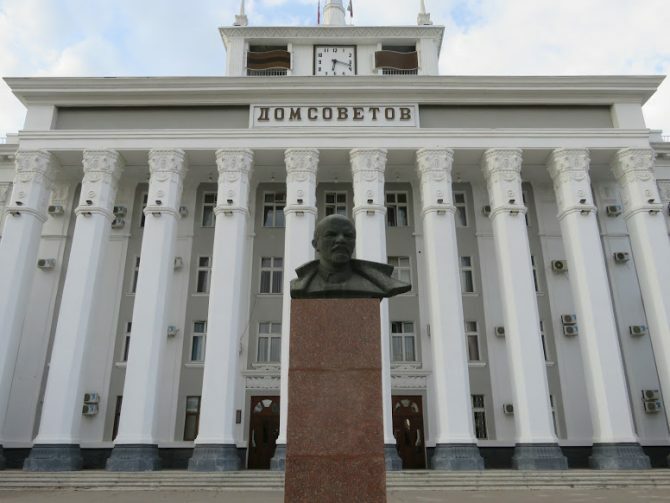 The best time to travel to Transnistria is during independence day on the 2nd of September. It is great to see Tiraspol in such a festive atmosphere. Other interesting holidays to experience in Tiraspol are Victory day on the 9th of May and Maslenitsa in the beginning of march. Weather wise Transnistria has hot summers and cold winters, making spring and autumn the best time to travel to Transnistria. EU and US citizens can travel to Transnistria without any problems. All you have to do is fill in a migration card at the border. If you arrive by bus tell the driver you need to get out for registration. When you enter by train register yourself at the immigration counter in the train station. This will give you access to Transnistria for 10 hours. If you intend to stay longer make sure you mention this. Tell them how long you plan to stay and provide the address of your accomodation. Since 2018 visas are issued for up to 10 days without further obligation to register at the immigration office. They will give you a piece of paper that you have to keep carefully, because you need it again when you leave the country. Is it safe to travel to Transnistria? It is absolutely safe to travel to Transnistria. The conflict is a frozen conflict and there hasn’t been any violence for years. I travelled with public transport and I felt safe everywhere. Transnistria used to have a negative image for corruption and the border crossings were notorious places. But this also seems to be the past and I crossed the border without any problems. What remains strictly forbidden is taking pictures of military facilities or the security forces. When you are in doubt it is better to ask rather than flashing your camera around. In the best case people become suspicious of you, but in the worst case you could get arrested. Another no go is overstaying your visa. Check the date on your slip of paper. If you want to stay longer and forgot to mention this at the border just go to the immigration office in Tiraspol. It is an easy process to extend your stay. Transnistria uses the Transnistrian ruble that can only be used in Transnistria itself. ATM’s are unreliable and its best to bring enough Moldovan lei, Ukrainian Hryvne, Euro’s or US dollars to exchange. There are no embassies or consulates in Transnistria, with the exception of the break away republics of Abchazia and Ossetia. Together they form the commonwealth of unrecognized states. Their consulates are at the 25 October street number 76. Teens of Transnistria is a beautiful collections of photo’s on what it means to grow up in a country shunned by the rest of the world. Such a unique place to visit and I do love a bit of Soviet architecture and that feeling of time stood still. Cool post.. And yes, I never heard of Tiraspol or Transnistria. Might have to go for a visit now. Do you know if the hostel has single rooms,or is it just dorms?What price of single room?Dorm room?Phone number of landlord?Is it difficult to travel just speaking english? The hostel has one double room and one dormitory room. english is not widely spoken, but i had no trouble travelling around.